That is the objective of The 30-30 Report. With a four-year track record of identifying the next top performing small cap and microcaps before the rest of Wall Street, we provide you with stocks that could rise 30% in 30 days! The 30-30 Report is a monthly stock newsletter with a history of providing the top small cap and microcap winners. The 30-30 Report is a great newsletter. I have made a lot of money on some of your picks. I play the stocks you feature a number of ways and have had great success. This report has had amazing picks and is at a ridiculosly low cost. As a current subscriber, I can attest to the success I have enjoyed trading. This publication is a winner!! Best newsletter around. Stock picks rock. The biggest winners ahead of the market. Got in at special price. Very happy. What is The 30-30 Report? 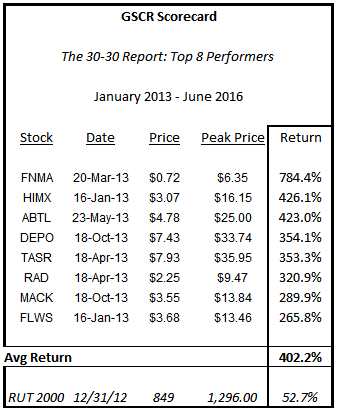 The 30-30 Report is a monthly newsletter that profiles 3 stocks that we believe will rise at least 30% in 30 days. Our tremendous track record has already attracted many subscribers since its introduction in 2012. From May 2012 through April 2016, nearly half of the more than 100 stocks profiled have reached the targeted 30% mark while our top 5 performers are up an average of 468% from profile price to peak price! What Type Of Stocks Are Featured? All of the stocks featured in the report are typically NASDAQ or NYSE listed stocks and usually range in price from $1-$15. They can be in any industry and can be your typical hyper-growth microcaps or even Growth at a Reasonable Price (GARP) small caps. All of the stock ideas are generated independently, and there is no sponsored research whatsoever associated with the stocks featured in this report. How Are the Picks Generated? At Goldman Small Cap Research, we have a unique investment strategy designed years ago over a 13 month period that marries fundamental analysis with technical analysis and other intangibles. This stock-picking, trading, and investment process has proven so successful, that founder Rob Goldman’s model portfolio was ranked the 4th best performing small cap portfolio in the country, during his time as a small cap money manager. Over the past few years, we have painstakingly refined the process further and began putting it to use in 2010. As a result, since May 2012, we have introduced dozens of stocks that have risen 30% or more in a very short period of time. Anyone that has ever invested in stocks and is looking for lower-risk, large returns from high-quality, low-priced stocks, needs to subscribe. Whether you consider yourself a trader or an investor, this will be your new stock trading and information guide and teach you tricks of the trade for your entire investment portfolio. The 30-30 Report is published on the 3rd Thursday of each month, and is emailed directly into your inbox. All past and current issues can be downloaded on the premium section of Goldman Small Cap Research, www.goldmanresearch.com. In addition to the report, we publish exclusive updates and "Sell Alerts" as needed, in order to maximize returns. 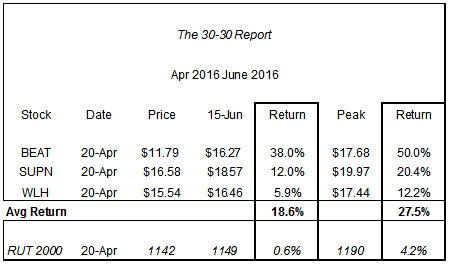 An annual subscription to The 30-30 Report is just $119, which works out to less than $3/per stock pick!!! A great value by any measure! As a new Premium subscriber to Goldman Small Cap Research, you will have free access to our special conference calls with analysts, CEOs, key executives, and market players that are leaders in the small cap stock arena throughout the year. These aren’t your usual hokey, boring investment presentations. With these calls, you will get actionable, trading ideas and information. Be on the lookout for further details. You will also receive a copy of our upcoming book, The Analyst Guide to Small Cap Investing, due out in by year-end 2015. You will learn some of the secrets to our stock picking and trading strategy which can increase your trading and investment returns even further. Even if you subscribe to other newsletters, the price is right for this must-have publication.The 30-30 Report is the source for top performing microcap and small cap stocks.